I've integrated PayPal as my payment processor..when my customers payments are being rejected...so I need an API credential for jotform..? You do not need an API when integrating your form with PayPal. You just need to set it up by adding your PayPal username (PayPal email address) in the integration settings. However, I see that you have added an email address in the Paypal field. Can you confirm that this is the correct email address of your Paypal account? Also, can you give us a bit of information on what kind of error (reject) occurs? Link email addresses are either EPeventsmiami@gmail.com, info at laundry305.net, or mylazylaundry@gmail.com. Any of those listed are linked to my PayPal account. When the guest go on to pay as a guest or signing into their personal PayPal accounts, when they press submit payment it sends a message saying unable to except payment at this time please return to merchant four different payment method. I cloned your form and enabled "Sandbox" mode and tested paying, I was able to successfully complete the test payment. This should work correctly unless the customer doesn't have sufficient amount in their paypal account. Then you should use the "Paypal Pro" widget to select either pay directly using credit/debit card or via paypal account. You can read more details regarding the difference of Paypal and Paypal Pro on the link below. 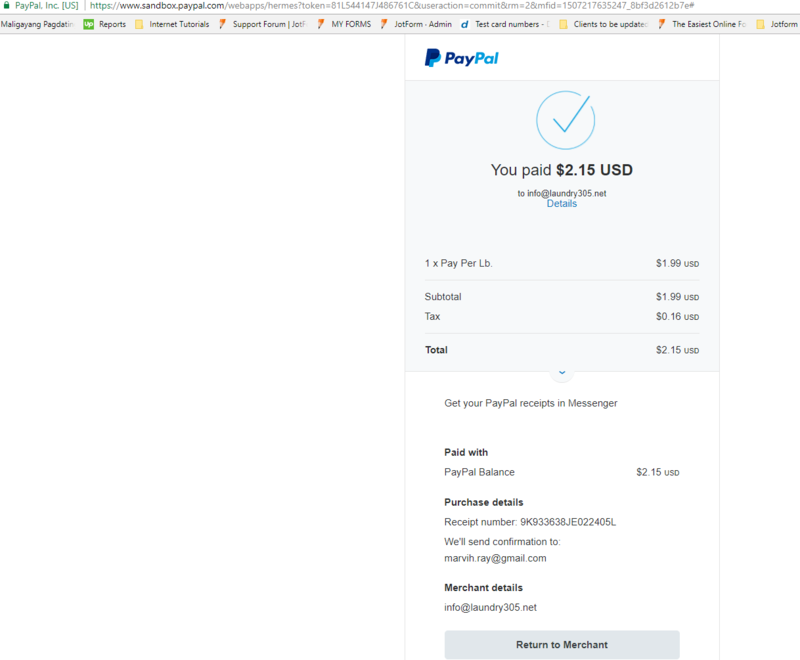 Here is the guide on how to setup paypal pro payment integration.